Wow, what a lot of surprising events being packed into one book. 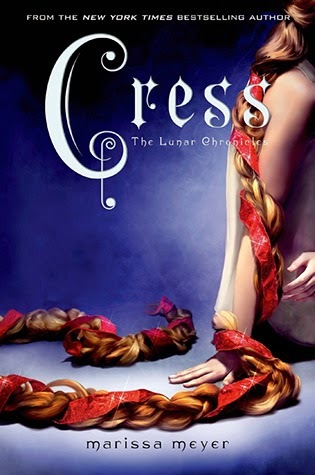 Cress is a genius little girl, well technically lunar shell, being kept as a prisoner in a spaceship for the last 7 years by mistress Sybill (head thaumaturge). Her life's work is to spy, infiltrate earth's systems, hide the lunar ships from detection and her dream is to have her epic romance with Thorne. Their relationship is so sweet, poor Thorne becomes blind as a result of a head injury and forced by circumstance cress and Thorne need each other to survive. Thorne's funny comments were the highlight of this book for me. Plus the last few chapters, but no spoilers! Scarlet is kidnapped, and wolf is left heartbroken. Cinders on her mission to stop the wedding and Iko is dutifully assisting her as best she can. Levana is threatening everyone with her lunar monsters, to ensure the wedding with Kai takes place. Dr Erland is somewhere in Africa waiting fro cinder to turn up ever since he told her she's the lost princess, but you can't imagine his surprise when cinder and her entourage finally arrive. What I love most about this book is how everything and everyone is linked.. I'm looking forward to the next part of this series, where we learn more about Princess Winter. Although she is Lunar, she hasn't used her gift for years and as a result has started going crazy. Plus, she has been gifted Scarlet so I'd love to see how that plays out and how wolf rescues her, because after all this time, scarlet is the damsel in‎ distress. "You just played back-to-back doubles. You can't do that." Cinder crossed her arms. "Thorne, I just downloaded the official rulebook into my brain. I know what I can and can't do." "Aha!" He snapped his fingers. "See, you can't just download stuff in the middle of a game of Royals. House rules. You're cheating." “But you’re a prisoner,” said Thorne. “I prefer damsel in distress,” she murmured. He hated Levana. He hated himself for giving in to her. He hated that his father had managed to keep her and her threats of war at bay for years and years, and within weeks of Kai taking the throne, he’d let everything fall apart. He hated that Queen Levana had probably been planning this from the moment it was announced that Emperor Rikan, Kai’s father, was ill, and that Kai had played right into her hands. He hated that she was going to win. It always came back to love. More than freedom, more than acceptance- love. True love, like they sang about in the second era. The kind that filled up a person’s soul. The kind that lent itself to dramatic gestures and sacrifices. The kind that was irresistible and all-encompassing. “Can we discuss the imaginary money later?” said Cinder. “Like, maybe when there’s actual money to discuss?” suggested Scarlet. She pressed her lips and glared at him, but his mocking grin had swept away any hints of sincerity. Sobbing, Cress buried her face against his chest and let the tears come. She cried hard at first, the release pouring out of her all at once. But she almost felt guilty when, minutes later, the tears already started to dry up. Her sadness wasn’t enough. Her mourning wasn’t enough. But it was all she had.